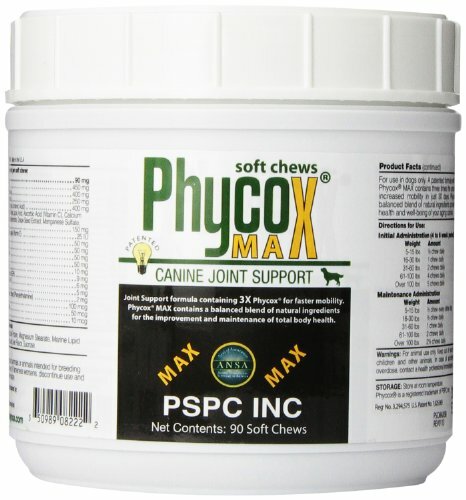 PhyCox® MAX HA Soft Chews containing 3X Phycox® for faster mobility. Phycox® MAX 3X is a novel, patented support matrix containing 3X the amount of phycocyanin, an extract of blue-green algae, found to function as an anti-inflammatory and antioxidant. 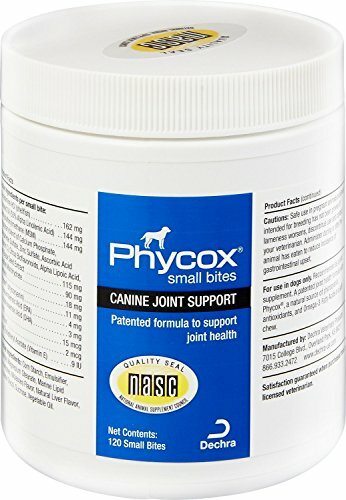 The Phycox® MAX 3X formula is geared towards the mature dog for increased mobility in just 30 days, and contains a balanced blend of natural ingredients proven to aid in the general health and well-being of your aging and mature dog. Nutritional requirements change with age. Phycox® MAX 3X addresses concerns with heart health, obesity, blood glucose levels, and urinary tract health that are common in your mature dog. Improvements over regular PhyCox® formula Increased anti-inflammatory activity with greater analgesic effects Improved weight loss in aging dogs Improved control of blood glucose levels Potent antioxidant, immune boosting functions, and auto immunomodulating functions PhyCox® has all the joint support benefits of many commonly used products, plus scientific research has shown Phycox® to be effective at reducing pain and inflammation in dogs. 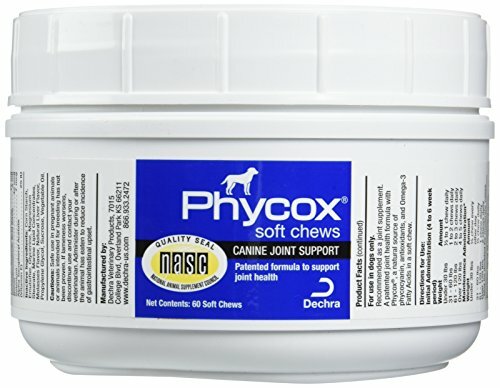 Phycox® MAX Small Bites Soft Chews contain 3X Phycox® for faster mobility. Phycox® MAX 3X is a novel, patented support matrix containing 3X the amount of phycocyanin, an extract of blue-green algae, found to function as an anti-inflammatory and antioxidant. 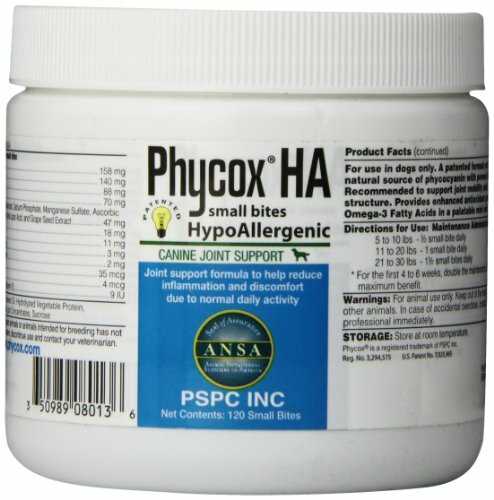 The Phycox® MAX 3X formula is geared towards the mature dog for increased mobility in just 30 days, and contains a balanced blend of natural ingredients proven to aid in the general health and well-being of your aging and mature dog. Nutritional requirements change with age. Phycox® MAX 3X addresses concerns with heart health, obesity, blood glucose levels, and urinary tract health that are common in your mature dog. Improvements over regular Phycox® formula Increased anti-inflammatory activity with greater analgesic effects Improved weight loss in aging dogs Improved control of blood glucose levels Potent antioxidant, immune boosting functions, and auto immunomodulating functions Phycox® has all the joint support benefits of many commonly used products, plus scientific research has shown Phycox® to be effective at reducing pain and inflammation in dogs. 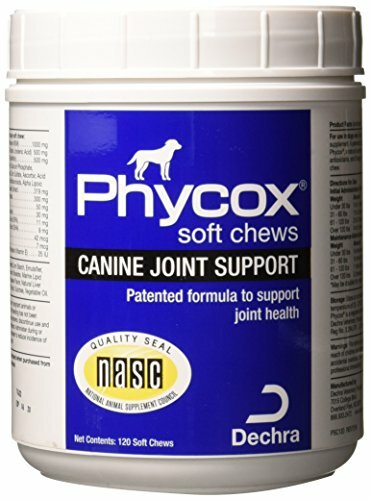 PhyCox® ONE MAX Soft Chews containing 3X Phycox® for faster mobility. Phycox® MAX 3X is a novel, patented support matrix containing 3X the amount of phycocyanin, an extract of blue-green algae, found to function as an anti-inflammatory and antioxidant. The Phycox® MAX 3X formula is geared towards the mature dog for increased mobility in just 30 days, and contains a balanced blend of natural ingredients proven to aid in the general health and well-being of your aging and mature dog. Nutritional requirements change with age. Phycox® MAX 3X addresses concerns with heart health, obesity, blood glucose levels, and urinary tract health that are common in your mature dog. Improvements over regular PhyCox® formula Increased anti-inflammatory activity with greater analgesic effects Improved weight loss in aging dogs Improved control of blood glucose levels Potent antioxidant, immune boosting functions, and auto immunomodulating functions PhyCox® has all the joint support benefits of many commonly used products, plus scientific research has shown Phycox® to be effective at reducing pain and inflammation in dogs. This item includes a FREE bag of treats fortified with glucosamine for added joint support you and your dog both can smile about! For use in dogs only. A patented formula with Phycox. A natural source of phycocyanin with proven health benefits. Recommended to support joint mobility and healthy bone structure. Provides enhanced antioxidant protection and Omega-3 Fatty Acids in a palatable mini soft chew. 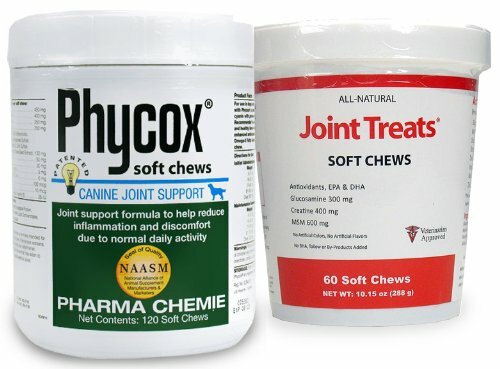 PhyCox Soft Chews joint supplement for dogs are formulated with a synergistic combination of ingredients to help relieve inflammation as part of normal daily activity. Phycox is a naturally derived extract of wild blue-green algae grown in the United States. Blue-green algae are a rich source of phytonutrients including Phycocyanin, a biliprotein that has scientifically demonstrated health benefits. Joint pain brought on by many forms of arthritis is becoming increasingly more common in geriatric dogs. This unique anti-inflammatory has been proven to improve mobility, activity level, alertness and the ability to rise. Within a month your dog will be as playful as he was the day you brought him home as a puppy. 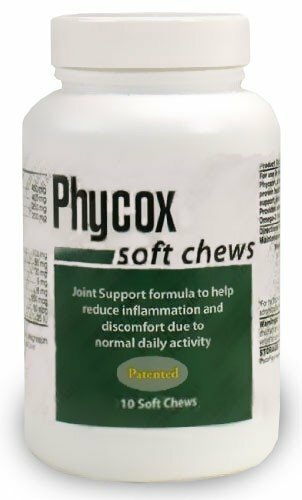 The Phycox patented process produces a highly concentrated source of Phycocyanin, offering strong joint support and relief of discomfort in two ways: Proven Cyclooxygenase-2 (COX-2) · Inhibition: Numerous studies demonstrate the high concentrations of Phycocyanin found in Phycox specifically inhibit the COX-2 enzyme, blocking the synthesis of inflammatory eicosanoids, the natural mediators of inflammation in the body. Dynamic Antioxidant: · Phycocyanin has powerful free radical scavenging properties. It can help enhance the body's defense against the degradative effects of free radicals that cause cellular damage and play a role in a host of degenerative conditions in dogs. 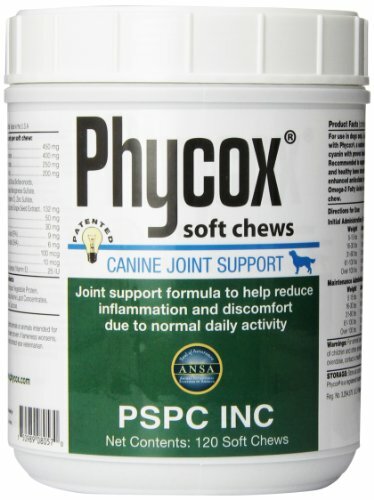 As with all of our products, Phycox Soft Chews contain the proven safe and effective joint supplements glucosamine and methylsulfonylmethane (MSM) for maximum joint and bone health, together with our patented* and revolutionary anti-inflammatory Phycox (proven to be completely COX-2 selective to prevent side effects associated with COX-1 inhibition) and other anti-oxidants and anti-inflammatories such as ascorbic acid, selenium and turmeric. 3-PACK PhyCox ONE Soft Chews (360 Soft Chews) + FREE JOINT TREATS!